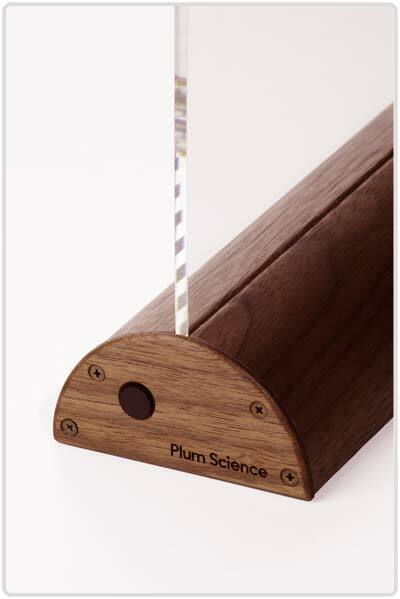 Glowide Wood is a major step forward in modern desk light design from Japan. Light from 21 high-brightness LEDs in the natural walnut wood base passes through a curved transparent acrylic plate, and gently shines from its tip. Using dual-edge refraction technology, Glowide achieves a wide, clear and uniform illumination, crucial for reducing eye fatigue. A stylish and smart choice for your desktop. Glowide was born to expand the boundaries of desk lighting. Conventional desk lights fail to light up a sufficiently wide area uniformly, leading to glare and eye strain. Glowide's prime objective is to minimize such deviations in brightness across the desk surface, and uniformly illuminate an optimally wide rectangular area. Glowide is also a work of art. 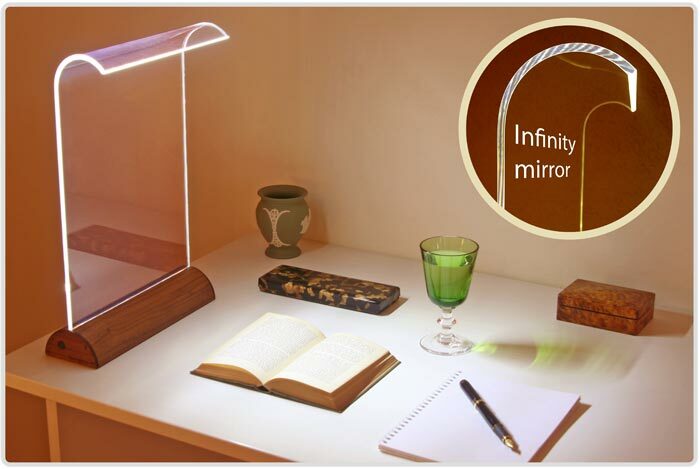 Its parallel-sided transparent acrylic plate acts like an infinity mirror that traps the light inside to give a beautiful zebra-stripe pattern on the sides. Glowide's minimalist contour fits effortlessly into a variety of locations. Being transparent, it fits seamlessly in your study, as well as in your living room, dining room or bedroom. Why not add a touch of style to your chosen space with Glowide Wood? The wood base sets off the polished acrylic to give a refined look. The tip of the diamond-cut acrylic plate, bevelled with two edges set at mathematically optimized angles, refracts the light in two separate directions to brightly illuminate a wide 60 cm × 40 cm area with enhanced uniformity. In addition, the wide light source minimizes shadows from your hands and arms. Good for you and the Earth. Our design uses 21 quality Nichia Corporation high-brightness LEDs mounted in the wood base, consuming only 6 W of power but giving you the equivalent brightness of a 150 W incandescent light bulb*. Being equipped with an in-line cord switch, Glowide avoids standby power loss. Glowide lights up just the right area with minimal light leakage to other parts of the room. 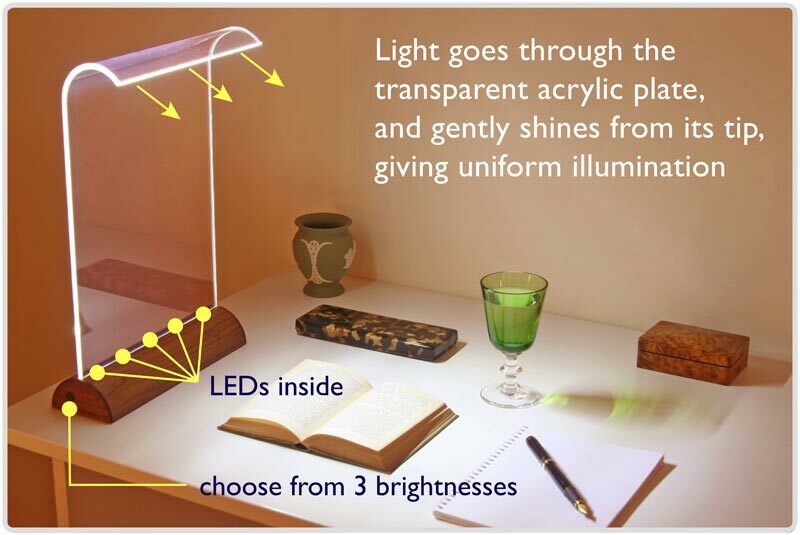 UV light from the LEDs is filtered out by the acrylic plate, providing gentle illumination at 3 levels without eye strain. Glowide Wood is available with white or warm white LEDs, the latter for a cozy feel to match the wooden design. Glowide Wood comes with a 2-year guarantee on manufacture and operation. But the Nichia LEDs stay bright and maintain colour for up to 60,000 hours** thanks to efficient cooling through the internal aluminium heat sink in the base. 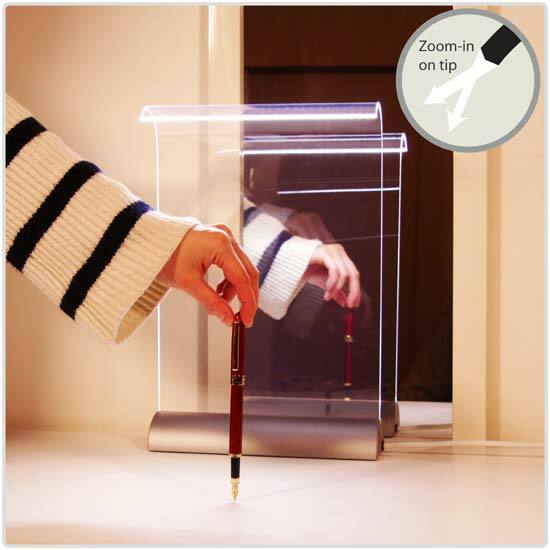 Moreover, the acrylic is hard-coated for durability. Glowide is built to last.